The latest installment of Boom! Studio's ongoing Peanuts comic book arrived in stores this Wednesday, November 19, 2014. Issue #23 includes the stories "Eraserophagia," "The Eyes Have It," and "Toodle-oo Caribou," as well as the regularly featured classic Peanuts Sunday comic strips. You can see an eight-page preview - including the alternate variant cover - at Comic Book Resources. 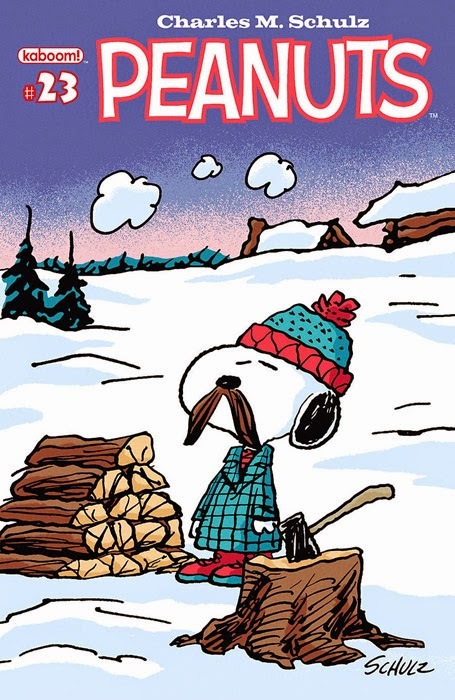 Comic Book Resources also has a new interview with Peanuts comic book writers and artists Paige Braddock and Vicki Scott. In it they reveal that Peanuts #25, due out February 2015, will be an extra-large, single-story anniversary issue focusing on the gang going to summer camp (which, as fans know, was a recurring storyline in the original comic strip).